RECENT EVENTS AT THE BURY RADIO SOCIETY CLUB. On Tuesday the 16th of April Toby passed his Foundation exam. Tuesday the 2nd of April. Mobile operating for the Foundation licence via Burrs park and ELR. Mini Dxpedition to Anglesey. This month Peter G0GPH, Rod 2E0EVI and Paul M0OWS operated /p on Saturday the 30th of March. Accomodation and operating bringing fun to all three participants. Erecting the Invisible aerial is never easy!. The talk by Keith was on the evening of the 12th of March. Starting the talk off with Keith in the background, then a side view and finally a shot including the remaining members. Extract from Facebook courtesy of Paul M0OWS announcing our EGM on Tuesday the 26th of February. Tuesday the 12th of February saw an AGM at the shack for RAYNET delayed by Dave M0LMN due to illness. Instead on the 12th of February. Steve's Talk on was given on Ferrites. Our enthusiastic YL Lynda G6QA makes a comment. While Steve and Keith discuss the proceedings. Members gathered in anticipation. Coil winding and Antenna erection. An example of tools etc used on the evening. Observations being held on the 5th of February. Steve, Dave, Peter and Mike discuss the procedure. Keith joins the merry throng with his two pennyworth. Our first workshop on the 29th of January 2019. A few members braved the bitter January snow and ice to take part in the first half of our project to build a 2 meter antenna. Basic equipment and tools used by the group. We finished our AGM from December the 11th on Tuesday the 22nd of January with nine members attending. Committee members and some ordinary members assembling before the AGM started. Discussions were held between members Peter and Rod while committee members Keith and Mike checked over the minutes. Our first event of this year was at "Giants Seat"
Equipment used on the weekend. Peter and Rod enjoying the event. Peter assisted by Keith our chairman. Peter and Lynda G6QA checking world callsigns. Rod and Keith relaxing between QSO's. Essential equipment set up and ready to begin. More essential equipment being prepared. The final event of this year was the December AGM, a strong turn out as usual producing a good and lively debate. Further info is available on request from any committee member. New positions and re-arrangement of the previous committee setup holds an opportunity for our newer members to have a more active role in our future events next year and forthcoming years. Many thanks to all who attended and those who put themselves forward for positions within our committee group. Keith G3RTU opening the AGM on the 11th of December 2018. Peter G2GPH giving his report on training for the year and future prospects for the club. A demonstration of the FT726 was given by Peter & Chris on Tuesday the 13th of November. Seen above in front of the monitor. Chris giving a history of the rig and Peter explaining the intricacies of setup and headaches of fault finding. Much to the amusement of the members. An informal get together was arranged for Friday the 26th of October. As can be seen, a good afternoon's chat. Members attending the convention on the 13th of October. Four members attending the RSGB conventionon the 13th and 14th of October. Held in Milton Keynes 2018. James now M6WUM passed his Foundation exam with flying colours. Now studying for his Intermediate licence. A gaggle ( group ) of members visiting the Hamfest early in October. On the 22nd and 23rd of September Mo and Dave were active in ROTA from Bury station. referring to our collaboration on the Flying Scotsman SES. Special Event Station GB0FS on Flying Scotsman 15th September 2018. Unfortunately this was cancelled beyond out control. 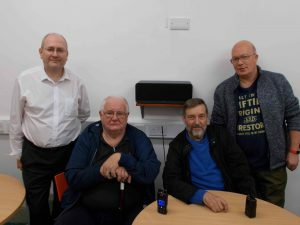 Rochdale And District Amateur Radio Society (RADARS) was host tonight to Dave Robinson M0LMN and Maurice Fletcher M0TXK from Bury Radio Society. Dave and Maurice came to the Rochdale club to talk about their plans to run the special event station GB0FS from the Flying Scotsman steam locomotive on Saturday 15th September 2018. The Flying Scotsman will haul The Wells Flyer, a seaside special, from East Lancashire Railways Bury to Holyhead and return on Saturday 15th September 2018 to raise funds for the purchase of ‘City of Wells’. Onboard the special will be Dave M0LMN and Maurice M0TXK who will operate GB0FS (FS for Flying Scotsman) through the GB7MR DMR repeater located in Bury and sponsored by Rochdale And District Amateur Radio Society (RADARS). They also hope to also speak to other amateur radio operators on 2 metres FM and other repeaters that they can access on the day. For those interested in seeing the Flying Scotsman, it will have a busy schedule departing from ELR Bury at 07:15am arriving at Holyhead at 12:45; departing from Holyhead at 14:45 and returning to ELR Bury at 20:30pm. The publicised route is ELR Bury, ELR Heywood, Manchester Victoria, Newton Le Willows, Warrington, Llandudno, and Holyhead. It is expected that Flying Scotsman will pass through ELR Bury, ELR Heywood, Castleton, Mills Hill, Moston, Manchester Victoria, Eccles, Patricroft, Glazebury, Newton-Le-Willows, Warrington Bay Quay, before travelling onwards to Wales, giving many good opportunities for photographers. It is expected that the special event station GB0FS will be heard on timeslot 2 talkgroup 9 (local) and timeslot 1 talkgroup 235 (UK wide). Whilst it is not intended to tie-up talkgroup 235 or prevent other users from using the national DMR network, it is hoped many amateur radio operators UK wide will be interested to call in on special event station GB0FS operating from the Flying Scotsman. Stop Press! Dave and Mo's GB0FS SES! Tuesday 14th of August...Chris G4JAG gave a demo of his rig. Chris's setup with psu and dummy load. Keith G3RTU introducing the evenings entertainment. Chris explaining the controls to assembled members. Explaining the various controls. Answering questions from members. A hand unit to program the rig which arrives with the equipment as standard. Chris answering queries from the group. Tuesday the 10th of July..Another great evening by Steve. Steve's Poster prior to his talk..Arcs and Sparks. The history of Spark Transmission. A good start to Steve's talk. Rod even raising a glass in anticipation. Left to Right..Steve, Peter, Martin, Chris, Jim, Rod and Mo hiding. The monitor used during the talk, small but ample for the job. Steve G3OAG in full flow. Watching and enjoying the evening. On the 26th 0f June both Rod and Tom took and passed their intermediate exams at our new centre in the Trackside area. Both are looking forward to their new licences and we all congratulate them on getting this. Rod with Peter and Tom. A visit from Mike Kelly ( ELR ) and Dave Wilson ( RSGB ). The evening of the 12th of June 2018.
with Dave Wilson President of the RSGB. Dave explaining the new exam system. Members and visitors enjoying the evening. Mike gave us an overview of the work of the volunteers at East Lancs Railway. to how much dedication is put into the smooth running of ELR. Next Dave gave us an insight into the new online exam procedure at the RSGB. having the same set of questions appealed to some members as a very good move. The evening was brought to a close with applause and cakes arranged by Peter G2DPL. Mike Kelly from ELR. Mike and our own Keith. Dave Wilson from the RSGB. Members and visitors listening to Dave M0OBW. Our stand this year showing many previous great days out. Peter G2DPL enjoying the day. Peter G0GPH and Rod M6JUW enjoying a chat about radio with some light refreshments. Peter admiring our latest setup. Keith G3RTU kicking the night off for an open discussion. On Saturday the 31st of March , the club held a SES to celebrate the arrival of the Tornado. Unfortunately due to poor conditions and bad weather the proposed Sunday event was sadly cancelled. On Tuesday the 20th of March we opened the trackside venue with a well attended Inaugural meeting. Sixteen members and guests where in attendance during the evening. Members and guests who attended our inaugural meeting on Tuesday. Paul and Keith chatting during the evening. Dave and Mo talking with some guests. Many members sitting around our new venue and indulging in the selection of chocs and bites. Martin's setup for the evening, which worked well. Martin demonstrating his rig and computer to Jim. Four more members...Rod, Mo, Steve and Peter with a collection of components. A Special EGM was taken on Tuesday the 6th of March. Peter G0GPH gave a talk entitled "WSPRlite" on Tuesday the 13th of February at the Mosses Centre. Well received with a few interesting questions during and after. The unit as described by Peter during his talk. Commencing his evening talk. The basic features of a WSPR system. Peter discussing various points brought up. Typical signal to noise ratio's from different modes. Members at the club meet. Peter G0GPH during the evening. In conclusion.."The one that got away"?. Our first talk of the year was by Keith G3RTU and explained the principles of DMR. Entitled..... "My introduction to DMR"
The evening comprised a nice talkthrough of the DMR system including differences between various types. Looking at Zones and channels and how best to use them. A few graphs to illustrate some points, and ending with a demo using Keith's Raspberry pie,dongle,the internet, a TYT transceiver, speakers and projected image for all to see. A station on the western seaboard of the United States was clearly heard. Keith at the start of the talk. Martin, Mo and Chris during the demo. Our AGM was held on the 12th of December.........any further info available on request. gave us a quiz night. Rod and Keith at the quiz. Many thanks to Steve for another good evening. A recent visit to the RSGB convention by Keith, Steve, Paul and Peter on Saturday the 14th of October. Above are two views of the RSGB convention with Steve, Keith, Peter and Paul doing the top selfie. Members enjoying a day out in Bury September the 8th 2017. Paul and Keith at Freidrichshaven this year. As seen in the Radcom magazine. During the month of July Rod passed his foundation exam and Dave Nelson passed his finals with distinction. Tuesday 20th of June, Martins Quiz. Martin G6TAT held an evening of questions to boggle the minds of our members. Everyone enjoyed it, including the headaches created by some questions. Thoughtful and Puzzled . And some educated discussion!!!!! No violence was observed. Because of this man Martin G6TAT. Many thanks Martin for the entertaining evening. We held a field day event at Nuttal Park in Ramsbottom on the 23rd of May. Organised by courtesy of David Nelson, who managed the HF radio station within the provided building. An aerial was fed through a window and a convenient tree provided part of the fixtures. Rod's bowling arm apparently being put to good use!.Steve had a couple of CW contacts with this setup.Gaining more success than David's Fldigi attempts. Two further stations were set up outside. One by Mo with a portable antenna and magmount from his car. The other station was by Keith with his aerial erected from his back bumper and proving quite successful. Contact was made to Palestine with his callsign however further calls by Jim did not succeed in a qso!. Members present were Dave, Steve, Peter, Chris, Rod, Mo, Keith, Peter and Jim. Dave, "from t'hills", was unfortunately taken sick and therefore unable to attend. He did however manage a qso with our station GX3BRS. On Tuesday the 25th of April Keith G3RTU gave a talk to our members about logging facilities available to the Radio Amateur. These were covered with quite a few screen shots and examples of the ones that Keith had used in the past and present. The original premise was to introduce members who had not used any electronic logging before an overview of the different facilities available through these packages. Members who attended this years NARSA event, 2017 on April the 9th. From the left...Mo Steve..Keith and Dave. On Tuesday 28th of March, Keith G3RTU and Peter G0DPH gave us an in depth history and present standing of the Raynet organisation. It was an enjoyable as well as informative evening. Further info was produced by Chris G4JAG for all those wishing for more info. On the 17th of March 2017 a number of members had a get together luncheon in Bury at an Italian restaurant. Harry, Paul, Keith and Peter around the table discussing radio. Photo by Steve G3OAG. Same table with Steve on the left hand side. On the 28th of February 2017 Steve G3OAG gave an overall view of RF measurements from early days to the more recent developments in later years. Starting off with a projector slide show of earlier days. And complemented with a demonstration of his own equipment. Some home built over many years. Our AGM was done on the 20th of December and quite a few subjects were proposed and will be reconsidered later in the new year. A very well received talk was held by Martin, Keith and Steve entitled " How to use data modes ". This was initially meant for our newer members to see what possibilities and options were available with low power and free software. However the talk proved to be useful to all as it showed the many different types of modes that are available. The Flying Scotsman on her return with her Green Livery on the 15th and 16th of October 2016. This September GB0ELR was activated again by the Bury club. Many thanks to Dave and Mo for their great efforts in pulling this together. For details about our "Flying Scotsman" Special event station , please read our dedicated page.....Flying Scotsman. The ROTA weekend (26th/27th 0f September) was again a very successful event and below are some views of the qso's being conducted. We also included the opportunity to get some practical involvement and training for the newer members of our club. Keith G3RTU demonstrating good working practices to our new members, with advice from Peter G2DPL. Qso's and logging during the day's event, contacting many stations participating in the "Railways on the Air" ROTA event. On the 14th of April 2015 Martin gave a talk on digital systems entitled "Beeps and Burbles"
Martin beginning his introduction. Members attending the talk. Martin explaining about the software. Various members who enjoyed the talk. Previously on the 10th of March 2015. Steve gave us another interesting talk entitled "Homebrew..get your soldering iron out". Steve poses with his "work in progress" transceiver. As he explained this is a lifetime project with constant changes and upgrades. Steve G3OAG shows his homebrew transceiver to the group. Block diagram of the transceiver as explained by Steve. Dave (M0LMN) with Bury's Lady Mayor on Saturday 26th October 2014 during the Mosses successful open day. Members who attended Saturday's ROTA event on 27/28th of September 2014. Mike,Chris,Dave,Jim,Peter and Mo. Dave and Mo who organised and oversaw the whole weekend, operating the special event station. and 23 other ROTA stations on 20 & 40 metre, with a total of 197 QSO's logged. Dave setting up the Special Event station on Saturday morning. Operating the station during the morning of Saturday the 27th. Our banner in situ on the day. A previous talk given by Steve G3OAG about his Linear Amp. Below are two images taken during Steve's talk bout his experiences while building his linear amp. Many hours of painstaking work obviously went into getting it to its present condition. Our recent visit to NARSA at Blackpool on the 6th of April. We were very pleasantly surprised to receive this years award for the "Best website of the year". This had previously been the Magazine award but was changed by the committee as most clubs now find a website both quicker and cheaper. Below are some photo's of the award being presented on stage. Mike ( Chairman or NARSA ) at the commencement of this years ( 2014 ) winners in various categories. Jim, Keith and Peter on the NARSA stage , having just received the shield for this year 2014. Val (from Bolton Wireless Club) on the far left representing BYLARA and winning the best table on the day. Keith G3RTU gave a talk about remote transmitting via the TS590. Above is a screen view of the control programme used on the evening. While operating remotely through his own setup at home, we were able to observe Keith in a qso with another station, live on the air. Full function of the various options were explained by Keith, demonstrating all the bells and whistles available through this system. This included showing how the filtering could be changed quite easily and modes and frequency are simple to adjust. On completion, Keith was able to remotely close down his home station. An important point in all remote operations. A PREVIOUS VISIT TO BURY SOUTH SIGNAL BOX. On Thursday 31st October 2013 we had a visit to Bury South Signal box at Bury Train Station. at Bury. An enjoyable day was had by all visitors and we received a very informative talk from Phil. Many thanks to him for his detailed explanation and excellent knowledge of Signal boxes in general. Below are a couple of photo's of members enjoying lunch and inside the signal box. Members from left to Right..Mo (who organised the day), Jim, Dave, Mike (Secretary), Peter and Keith. Same members in waxworks format. Inside the Signal Box showing many of the levers involved in changing points and operating signals etc. PREVIOUS TALKS BY OUR OWN MEMBERS. Steve G3OAG gave a talk on the 14th of May 2013 entitled "Shortwave listening". Steve begins his interesting talk on shortwave listening. Some of the data modes used were demonstrated by Steve. Many international commercial stations play jingles before their commencement to enable easier tuning. Steve completed his talk with an interesting explanation on Rugby Radio GBR to round off an enjoyable evening. EARLIER IN THE YEAR . Keith/G3RTU gave a talk on the 9th of April entitled"The Raspberry PI"
Commencing his talk on Tuesday evening. Keith G3RTU explaining the raspberry PI peripherals. Members enjoying the very comprehensive demo of the Raspberry PI. Members, from the left, Martin G6TAT, David M1EKH, Mo M6CQH and Jim M0ANQ. To see our previous talks at the club please click here. Please check this page regularly to see our future events and images.